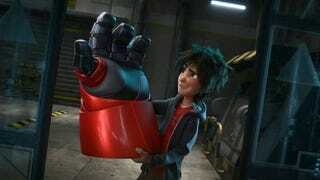 At one point during "Big Hero 6," my 12-year-old whispered to me, "I want to go to college." If the film's only redeeming quality were that it made heroes out of a lab full of college nerds developing mind-bending, spectacular gizmos, it still would be worth taking the kids. That the new Disney film is funny, emotional, imaginative, well-constructed and beautifully animated makes it a no-brainer for families looking to share a great film experience.